So there has been a lot of chatter in several wedding & event professional Facebook group pages about the most recent stats from Wedding Wire about "wedding planners". Instead of complaining about it, I decided to write a blog post to educate. See what people fail to realize that in an unregulated industry, the standards of every small wedding & event planning business owner can be different. There are no set standards, therefore, no right or wrong way to do something. But as a 12+ year educator (yep...I have credentials) in this creative arena, I felt it necessary to use my blogging muscle to share instead of creating chatter. Above is what you will initially see when viewing the Wedding Wire post for Chicago, IL. Well the main problem is the misuse of terminology. In the wedding and event planning industry, there's a "wedding planner", "wedding consultant" and "wedding coordinator/director". A WEDDING PLANNER offers full-service wedding planning. This person will help the couple with pretty much all of their wedding planning needs from start-to-finish. It's almost like they are a personal concierge and this service warrants the highest price. A WEDDING CONSULTANT is just that...a consultant. The couple is planning their wedding, but the wedding consultant is there to guide them through this journey. The consultant warrants mid-range pricing or less than a planner because the amount of service decreases. The WEDDING COORDINATOR/DIRECTOR is know as a "month-of" or "day-of" and basically implements the plans of the couple on wedding day. The couple has planned their entire wedding and the coordinator is going to execute the day. The coordinator warrants your base pricing or lowest amount. 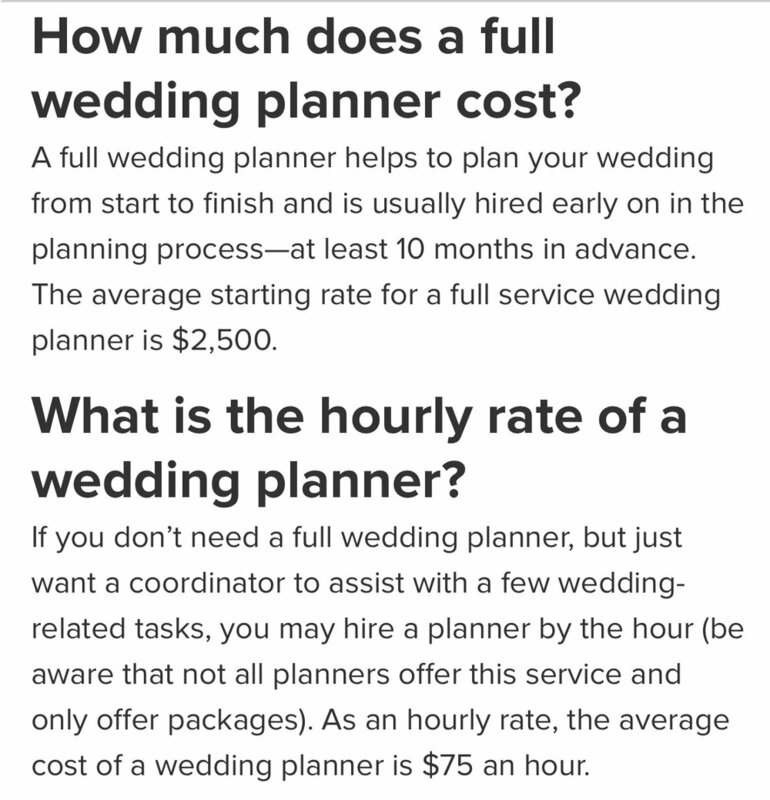 Based on this image, I feel Wedding Wire is giving suggested costs of the wedding coordinator/director. They misused the term, in my opinion. Now I know planners will argue me about the pricing, but again...it's totally up to the individual business owner what they will charge for their services. A new planner/consultant/coordinator/ is not going to be able to charge what a seasoned individual charges. Keep it real. I agree with the above screenshot, but I do have one problem. "Day-of" and "Month-of" are the same. NO coordinator is going to just show up on wedding day and implement your plans without meeting with you prior to the actual wedding day. But explaining those two terms is for another blog post so I'll digress at this moment. But Wedding Wire, you know better than that! I actually agree with this screenshot. I saw some had issues with Wedding Wire stating "You might not see your wedding planner much on the day of your wedding..." There is no problem there and agreed, that is how it should be. Our role is behind the scenes...not to be in the forefront with a perfect face and not a hair out of place. As long as you check in with your couple throughout the day and remain visible so they can motion for you if needed, what's the issue. The couple is enjoying their special day with family and friends. You standing next to them all day is going to ruin their wedding photos! LOL! Correct on this one when it speaks of "expect to pay more". If your planner is hired to assist with per-wedding and/or post-wedding events, it most likely will warrant a separate contract. At least with my company it will :) For the #DETeam, focusing on the wedding day is one contract. Anything else is considered a social event and we will have the client sign a separate agreement and pay an additional fee. Now if the client needs some basic information, we are not strict like that, and will share information/suggestions within reason. But if the client needs us to be on-site, that is another discussion. Okay...PUMP THE BREAKS! In Chicago, I do not know very many "day-of"/"month-of" COORDINATORS/DIRECTORS that will start off charging $750. I suggest you figure our how much your hourly rate should be for a 10-hour work day + 1-2 assistants (we do not work alone) + 1 or 2 meetings to learn of the details which could be anywhere from 1-2 hours per meeting + timeline development which takes hours, vendor calls, numerous e-mails with last minute tasks, etc. before listening to Wedding Wire on this total. Then they have the nerve to only add on an additional $50 to move up to "coordinator" status. This is comical to say the least! BOY BYE! Okay, let's back up a few steps. Wedding Wire says the wedding planner would charge $2500. I'm not going to say I agree or disagree with this charge (Dejanae Events does not charge this rate). Let's just say for blog-sake that I agree with the $75 hourly rate, divide that into $2500...that means your are only working 33+ hours on this entire wedding planning process over the course of 10 months. Ummmmm yeah. NO! Wedding Wire, it takes more than 3+ hours month to plan a wedding. Heck, responding to some of these client emails and text messages, research and vendor communications can take 5-10 hours a month. Trust me...if you charge $2500 for full service wedding planning, you will rethink your pricing after that wedding is over. FINALLY, I agree with Wedding Wire 100% on if a wedding planner will save you money. Yes we can and yes we will! A planner comes with a wealth of knowledge and vendor connections that can be very beneficial to the client. 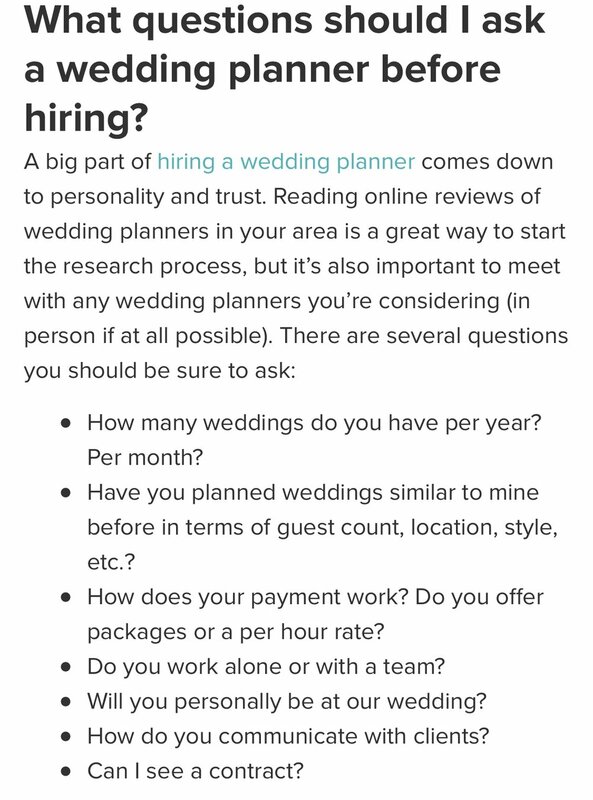 As for the section on "questions your should ask a wedding planner", I agree with pretty much all of these questions and am asked most of these during a potential client meeting/interview. But understand, the number of weddings we plan a month or year fluctuates because this is a seasonal business and every year is different. Well there you have it...my thoughts on the Wedding Wire post about "Wedding Planners". Of course you may not agree with what I wrote just like you may not agree with what Wedding Wire wrote. It's okay. The best advise I can give is to educate your clients about YOUR business and be truthful in your presentation. Experience and skills always plays a role when it comes to hiring a wedding planner/consultant/coordinator BUT your personality is also a major factor. BE TRUE TO YOURSELF. KNOW YOUR WORTH and STOP worrying about others opinions and what they think about your pricing.